Bulletin On SADC Health Ministers Jan 12th-16th 2015 – Sexual & Reproductive Health; & HIV: 2 New Scorecards, & Lessons for Uganda, Kenya, Nigeria,& Ethiopia. Significance of Sexual & Reproductive Health & Rights, to Human Security, & Human Development in SADC, & Africa as a Whole. Key Highlights & Findings – From Two New SADC Scorecards & Factsheets on: Universal Health Coverage; Sexual & Reproductive Health & Rights; & HIV – Ahead of January 12th – 15th SADC Health Ministers Conference Holding at Victoria Falls, Zimbabwe. (Being part of series on SRHR in Southern Africa). 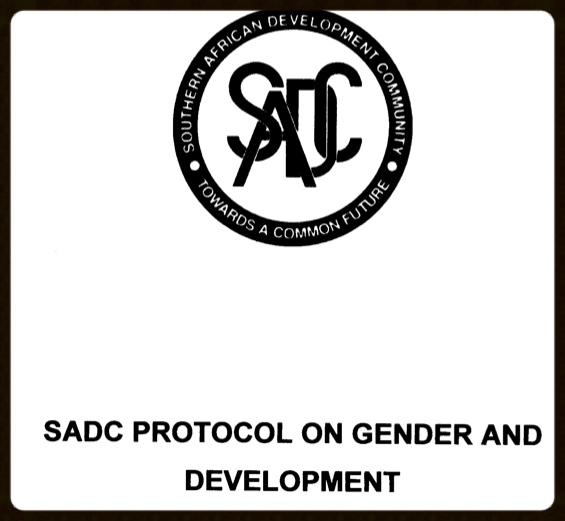 Special Public / Media Statement Calling on SADC Secretariat/ Southern Africa Ministers of Health, Gender, Youth & Education – to Commence Early Multisectoral Consultation Process on SADC Frameworks Due for Review & Renewal in 2015 – on Sexual & Reproductive Health, HIV, Gender & Youth. 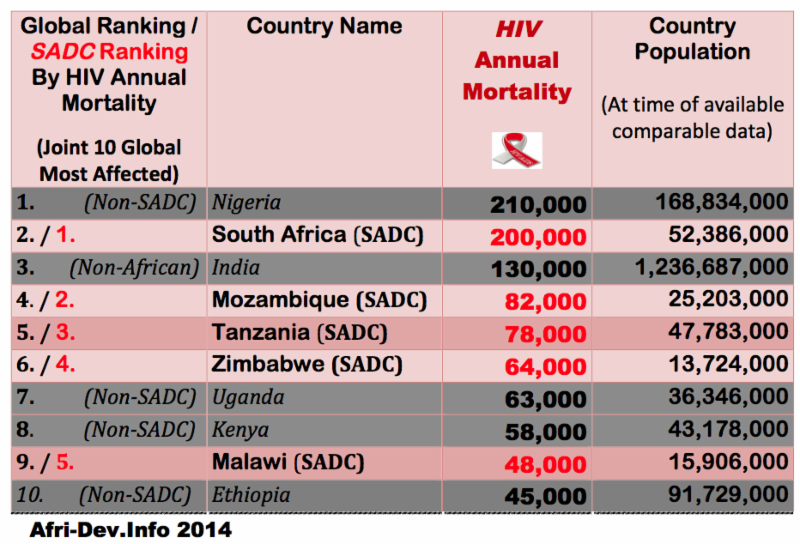 Caution for Non-SADC Countries on SRHR & HIV – Especially Nigeria, Kenya, Uganda & Ethiopia – Non-SADC African Countries Amongst Global Top Ten with Highest Numbers of People Living with HIV ; & Highest Global HIV Mortality. Key Highlights & Findings From Scorecards & Factsheets. Despite recent progress – new HIV infections in SADC alone are still astronomically high at an estimated 812,000 a year (maintaining the sub-regions position as epicenter of the global HIV epidemic) – compared to 21,086 infections for overall current Ebola epidemic (even allowing for epidemiological differences) – this makes poor Sexual and Reproductive Health one of the most significant and still unresolved human security and health governance challenges for SADC especially. [But not just in SADC. Poor Sexual & Reproductive Health is a mass killer: With annual HIV deaths in SADC alone running at an estimated 579,400 – compared to 8,289 deaths for current Ebola Epidemic (even allowing for epidemiological differences) – poor sexual and reproductive health and rights is clearly one of the biggest killers of our times (not counting deaths from maternal mortality including high fertility rate/poor family planning; or cervical cancer etc). [Again not just in SADC. With an estimated 14.6 million people living with HIV in SADC alone (the highest number in any single sub-region globally) – and roughly equivalent to the populations of either Malawi, Zambia or Zimbabwe – Improved policy and investment in Sexual and Reproductive Health remains fundamental to Universal Health Coverage, Right to Health, and overall Human Development and Security in the sub region. With all the 9 countries globally with HIV prevalence of above 10% to 27.4% in SADC – and with 6 out of the 10 of countries globally in which over 1 million people are living with HIV in SADC – Sexual and Reproductive Health must remain at top of SADC sub-regional and country level human security and health agendas. The only 5 countries globally facing Double Jeopardy – of both (1). HIV prevalence of over 10% and (2). Having 1 million or more people living with HIV in each country are in SADC – being South Africa, Mozambique, Zimbabwe, Zambia and Malawi. These countries especially must scale up investment in Sexual and Reproductive Health and Rights to reduce new infections – including improved treatment investment. The only 3 countries globally with HIV prevalence of over 20% are in SADC – being Swaziland, Lesotho and Botswana. These countries especially must rapidly scale up investment in Sexual and Reproductive Health and Rights to reduce new infections – in addition to improved treatment investment. Youth & Gender: With 9 out of 10 countries globally with highest HIV prevalence amongst girls and young women age 15 to 24 years in SADC; and with female prevalence at twice or thrice the prevalence amongst boys and young men of same age in most SADC countries – a SADC wide gender and youth based multisectoral policy and investment strategy for Sexual and Reproductive Health is crucial – to prevent a second wave pandemic amongst youth, and girls in particular. Commence early multisectoral consultation process across Health, Gender, Youth and Education sectors – inclusive of non-state stakeholders and civil society; work with Ministers of Finance and Economy to fast track investment; and establish Integrated special SRHR focal points at both SADC and country levels. Call on all non-SADC African countries amongst top ten most affected countries globally (by numbers living with HIV, or HIV mortality) – and amongst fastest growing youth populations (Nigeria, Kenya, Uganda & Ethiopia) – to spearhead East, Horn of Africa, and West Africa multisectoral based reviews of Sexual & Reproductive Health Strategies – to avoid possible double jeopardy of both high prevalence, and astronomically high numbers of people living with HIV. Media Statement Incorporating Call for Action to SADC Ministerial Conference, & Research Findings. *Public / Media Statement: SADC Ministers of Health Conference Zimbabwe, 12th to 15th January 2015. Special Call on SADC Ministers of Health Conference, Victoria Falls, Zimbabwe 12th to 15th January 2015 – to commence urgent multisectoral consultation process on due 2015 review and renewal of SADC frameworks on Sexual & Reproductive Health, HIV, Gender & Youth – inclusive of non-state stakeholders and civil society. Speaking to recent scorecards on Universal Health Coverage, Sexual and Reproductive Health, and HIV, in the context of SADC Ministers of Health Conference holding in Zimbabwe from 12th to 15th January 2015, Rotimi Sankore Editor of Afri-Dev.Info stated. “Despite significant progress, the unfortunate fact remains that the ten countries globally with the highest HIV prevalence are in Africa, and nine out of the ten are in SADC – with all of them still at high epidemic levels” – Swaziland 27.4% prevalence; Lesotho 22.9%; Botswana 21.9%; South Africa 19.1%; Zimbabwe 15.0%; Namibia 14.3%; Zambia 12.5%;Mozambique 10.8%; and Malawi 10.3%. [Note: Uganda is the only non-SADC country amongst top 10 globally with highest HIV prevalence at 7.4%]. (Including Various SADC & AU Frameworks Due for Review / Renewal in 2015; ICPD / UNFPA Report; UNAIDS Report; UNGA Resolution on SRHR; & Afri-Dev Scorecards / Factsheets). SADC SRHR & HIV Scorecard & Factsheet on – Adult HIV Prevalence; Estimated No’s of People Living With HIV; & New HIV Infections. SADC SRHR & HIV Scorecard & Factsheet – on Youth HIV Prevalence – Girls / Young Women & Boys/ Young Men Aged 15 – 24 Years. “Recognizes that the provision of universal health coverage requires full and effective implementation of the Beijing Platform for Action, the Programme of Action of the International Conference on Population and Development and the outcomes of their review conferences, including the commitments relating to sexual and reproductive health and the promotion and protection of all human rights in this context, and emphasizes the need for the provision of universal access to reproductive health, including family planning and sexual health, and the integration of reproductive health into national strategies and programmes”. Factsheet & Scorecard Research, Analysis, & Design By Africa Health, Human & Social Development Information Service (Afri-Dev. Info); & Afri-Dev Parliamentary Support Network; With Africa Coalition On Maternal Newborn & Child Health . © 2014. Kindly Acknowledge / Cite As Used.